Lee Suet Fern likes to "double-date" at work. In her case, it doesn't involve small talk over a leisurely dinner, but rather it's a term she uses to describe criss-crossing her sleek Bedmar & Shi-designed offices to meet two different sets of clients who sit in separate meeting rooms. This rather extreme version of multi-tasking is typical of the intense workload that one of Singapore's top corporate lawyers undertakes every day. Her day starts well before sunrise, and ends late in the night with meals at her desk and (if her schedule allows) late-ish dinners at home to break up a punishing schedule of packed meetings with clients and colleagues. But far from complaining, the founder of Stamford Law revels in her job, which has seen her being involved in some of the most high-profile corporate cases in Singapore, including the brawl over control of NatSteel Limited and Singapore Land's takeover of UIC. "The hours are long and irregular, but we need to be realistic. You can't do a good job unless you are prepared to give it your all. It's part of the whole package, part of the fun," Mrs Lee, 55, told The Business Times in an interview at her firm's offices at Ocean Financial Centre in Raffles Place. That uncompromising work ethic, coupled with a fierce intellect and a self-professed perfectionist streak, has made her one of the most sought-after legal brains in the corporate world. She was recently named the Best in Mergers and Acquisitions and Private Equity at the Euromoney Asia Women in Business Law Awards 2013, the second time she has earned the honour. In 2007, she received the inaugural Mondial Lifetime Achievement Award for Excellence in the legal sector by Trade publication Asian Legal Business. Mrs Lee founded Stamford Law in 2000 after stints at Lee & Lee, Norton Rose and Wong Partnership. Her firm, which boasts more than 100 lawyers, made its name doing corporate work, particularly in the mergers and acquisitions space. It has also expanded into other areas such as banking and finance, as well as disputes and litigation. Singapore Business Review currently ranks Stamford Law as the sixth-largest firm in Singapore, with considerably older firms such as Allen & Gledhill and Rajah & Tann ahead of it. But "size was never on our agenda, quality of work has". "It has never been our aim to be of a size where we have to undertake volume or churn work. We prefer to be the go-to firm for professional work of the best quality, with strong and assured delivery," she explained. In recent times, it has acted for Fraser and Neave in the group's $13.7 billion takeover saga, which involved the use of innovative procedures such as the use of break fees and a public auction. The firm also advised on the $5.59 billion Heineken/APB takeover offer, and Mrs Lee led the team on the sale of Petra Foods' cocoa ingredients division to Zurich-listed Barry Callebaut for US$950 million. Among its recent accolades, Stamford Law was awarded the M&A Asia Deal of the Year at the International Financial Law Review Asia Awards 2014 and was named Mergers & Acquisitions Law Firm of the Year at the Lawyers World Law Awards 2013. Mrs Lee is unambiguous about her passion for her profession and the dedication she believes every one of her client deserves. "I love the intellectual challenge, without that I wouldn't come to work. I love the ability to make a difference for the client, to be their advocate, to root for them, help them identify their issues and then find solutions to problems. I sit back and am amazed that they pay for this." The need for intellectual stimulation is a theme that crops up various times through the interview, whether it's the cases she works on, the people she interacts with, or the causes she takes up outside of the office. In person, there is no sign of the intensity that you would assume a professional of her calibre to demonstrate. What you get instead is an erudite, witty individual who clearly loves a laugh and appears to take herself less seriously than most. That levity may stem from the fact she sees her role as wife and mother as her true profession, and her lawyering as an extremely enjoyable hobby that has gone out of control. "My biggest challenge has been to raise my babies, while trying to deliver on a very demanding and omnipresent job," said Mrs Lee, who is married to Lee Hsien Yang, the younger son of former minister mentor Lee Kuan Yew. The "babies" she refers to are three sons aged between 19 and 29. "The challenge has been to raise three naughty little boys into young men to teach them the right kind of values, to develop the right strategies and skills for a competitive environment, and then the ability to respond with grace and humility whether they win or lose." While she claims to be a "terrible mother", clearly something has worked. Her two older sons have already racked up resumes that would be the envy of even the most demanding tiger mum. The eldest, Shengwu, is now pursuing his PhD in Economics at Stanford University after gaining a bachelor's degree in politics, philosophy and economics from Oxford University. Her second son, Huanwu, works at a private-equity firm in Singapore after a stint at Goldman Sachs. Their youngest child, Shaowu, recently started serving National Service. "They are wonderful, delightful, thoughtful, balanced human beings, and they turned out this way, notwithstanding their crazy mother. And because I work, they are very independent and when asked, they've said they wouldn't have it any other way," she said. She never consciously chose to pursue a career in law, but was steered into the profession by her very traditional parents. "I belong to a generation of children who listened to their parents, I don't think they exist any more! My father decided that the universe of professions was medicine and law. My brother wanted to be a doctor, so I needed to become the lawyer," said Mrs Lee, one of four children of economics professor Lim Chong Yah and his wife, a former teacher. She graduated with a Double First Tripos in Law from Cambridge University in 1980 and took up corporate law only because that was what all the big city firms in London specialised in. "It was never a conscious choice," she admitted. With no interest in litigation and conveyancing, she returned to Singapore and continued in her chosen specialisation, and proceeded over the years to make her name as one of the best in the business. At Stamford, she has fostered a disdain for cookie-cutter solutions, and urges her team to craft bespoke solutions for their clients. "In our DNA, we view each client's problems as unique. We draw on our experience but each one is unique, we must be prepared to practise law as a craft, we see it as artisanal," she explained. Despite her punishing schedule, she still makes time for other causes outside of work. 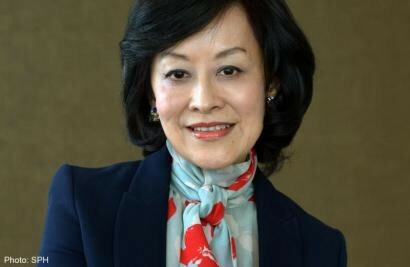 She is a member of the global board of French insurance giant AXA and also chairs the Asian Civilisations Museum board. She is also a member of the advisory board to the Law School at the Singapore Management University and a past president of the Inter-Pacific Bar Association. "My family is my real job, beyond that, the practice of the law. On all the rest my typical criteria is whether it's interesting, do I have something to contribute, would it expand my own horizons, would I have the opportunity to work with smart, able and interesting people?" she said. Amid the chaos of work and family, she credits her husband for being a stabilising rock of support, particularly in her professional pursuits. "My husband has been more than amazing and has always been wonderfully supportive. An added bonus is that he is a great cook," she gushed. "One of his favourite quotes is from Sheryl Sandberg's book, Lean In, to the effect that the most important career decision you can make is who you marry. It probably does matter enormously. If the partner at home cannot put up with irregular hours, or you crawling home at 3am, and you cannot say why except that you were working, then it will be a problem!"